Those who have only recently discovered the fascinating world of Ferrante and Teicher–and the fantastic piano sounds that cascade from it–will be pleasantly awakened by this album to the fact that the duo piano team has a firm foundation in the classical tradition. Music lovers who have long been admirers of the Ferrante and Teicher talent will welcome this newest addition to their record library–bringing the piano team's unique touch to twelve light classics familiar to practically everyone who listens to music... and is there anyone who doesn't? Long famed for the ultimate in unusual piano sounds, the two pianists have gained a wide reputation via records, television and personal appearances for their individualized piano stylings. Using the basic 88-key piano as a starting point, Arthur Ferrante and Louis Teicher have become masters at producing unexpected sounds by adding devices of their own invention, such as rubber wedges, wads of paper, bits of wood, metal bars and various other gadgets. Their three previous albums for ABC-Paramount ("Heavenly Sounds in Hi-Fi", ABC-221; "Ferrante and Teicher with Percussion", ABC-248; "Blast Off! ", ABC-285) have each presented those extraordinary musical interpretations. At the insistence of friends, critics and fans, Ferrante and Teicher have here recorded an album of beautiful music, standing strictly on its own melodic merit without gimmicks and without gadgets. The gifted keyboard duo has traveled the United States from coast to coast, as well as England and Canada, in numerous personal appearance tours. They have been seen on television with Perry Como, Steve Allen, Ernie Kovacs, Dave Garroway, Patti Page and Garry Moore. Their recordings have been consistent favorites. The classical climate is not new to Ferrante and Teicher. With strikingly similar backgrounds, they are both graduates of the Juilliard School of Music in New York City, where they astounded their instructors at an early age with an amazing grasp of piano technique. Upon graduation, both young men were appointed to the faculty at Juilliard–the ultimate compliment to their ability. Their first public appearance as a team occurred in 1947, when they performed as duo piano soloists with the Toledo Symphony Orchestra. In 1948, the two were permanently established as a professional piano team, and they have been appearing together since that time. Possessing a musically healthy balance of interest in both classical and popular music, these outstanding pianists include both in every performance. While expressing their admiration for compositions by Porter, Gershwin, Kern, Rodgers, etc., the program herein consists of music more closely connected with the classical feeling; music that has become widely familiar through repetition–and for that reason, termed "light classics," This musical style finds true appreciation among those listeners who are ordinarily wary of such composers as Bach, Beethoven and Chopin. 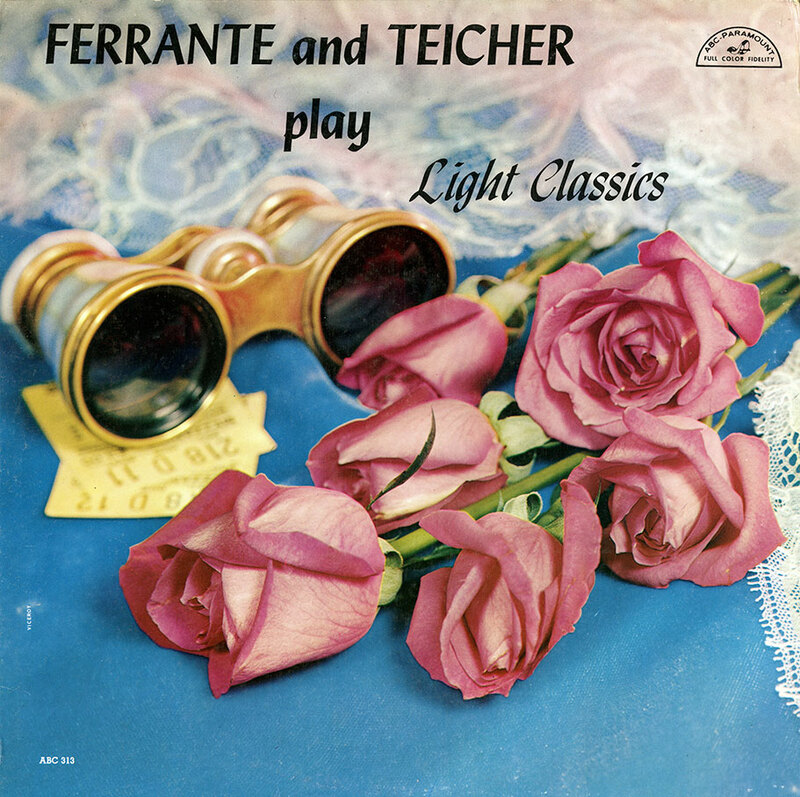 In a new setting and a new mood, Ferrante and Teicher Play Light Classics.